I want to share my experiences during my Nepal visit. Nepal is one of the finest tourists ‘ destinations. Kayaking and paragliding on serene walks between medieval temples and hidden spots are more memorable than a single visit. Kathmandu is the largest town and capital of Nepal. Kathmandu is a chaotic mix of tourist shops, walking agencies, hotels, restaurants, sites of worship and crafts. Kathmandu’s highlight has long been Durbar Square, the largest of the three Royal Cities ‘ palace squares and a UNESCO World Heritage Site. Here you can find temples and monuments of various forms, sizes, styles and faiths. Bhaktapur is located at the eastern corner of Kathmandu Valley, Nepal, approximately 8 miles from Kathmandu, the capital. Bhaktapur is widely known as the City of Culture, the Living Heritage, the Cultural Gem of Nepal, the Open Museum and the Devotee City. Bhaktapur is an ancient city renowned for its elegant art, fantastic culture, colorful festivals, traditional dancers and the indigenous lifestyle of the Newari Community. 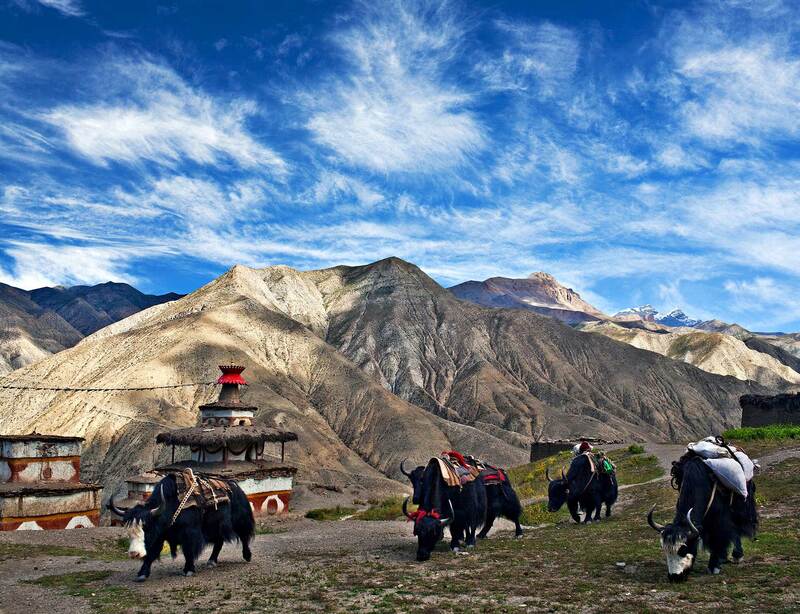 The Annapurna Circuit is a popular name for a trek in central Nepal’s Annapurna mountain range. The classic trek leads travelers up into the Himalayas, through plunging gorges, desert plateaus and lush subtropical valleys dotted with terraced farms. The walk goes through many religious sites and picturesque villages. The trek starts in Besisahar or Bhulbhule in the valley of the Marshyangdi river and ends in the Kali Gandaki Gorge. Patan is the 3rd largest city in Nepal after Kathmandu and Pokhara and is situated in the central southern part of the Kathmandu Valley. Patan is also called Manigal. It is best known for its rich cultural heritage, in particular its tradition of art and crafts. It is called the festival city, fine ancient art, a metal and a carving stone statue. Patan Durbar’s palaces, courtyards and temples were constructed in the 17th century and are the city’s main attractions. Pokhara is the second- largest metropolitan city in Nepal following Kathmandu. Pokhara is a popular resort destination for travelers from all over the world, known as the gateway to the Himalayas, with its tranquil lakes, vardant shorelines and mountain views. Phewa Lake, the largest of the three lakes in Pokhara, is lined with luxury hotels, restaurants, bars, shops and boating at Phewa Lake. Chitwan National Park is Nepal’s first national park. The park is home to rhinos, tigers from Bengal, leopards, sloth bears, gaur( buffalo) deer and many others. Dolphins( crocodiles) and freshwater dolphins live in rivers and streams but are seldom seen. Over 500 bird species make Chitwan an ornithologists ‘ paradise. Besides jeep tours, visitors can also enjoy jungle treks, elephant rides and canoe rides in the park. Chitwan is one of Asia’s finest wildlife destinations. Nagarkot is a village development committee in Kathmandu, 32km east. It is considered one of the most scenic spots in the Bhaktapur district at a height of 2195 metres. It is known for its sunrise view of the Himalayas, including Mount Everest, and other peaks in eastern Nepal’s Himalayan region. Nagarkot has a panoramic view of the Valley of Kathmandu. The scenic beauty of this place makes it a popular tourist walking trail. Khumbu( also known as the Everest Region) is a Northeastern region of Nepal on Mount Everest ‘s Nepalese side. It includes Namche Bazaar and Thame, Khumjung, Pangboche, Pheriche and Kunde villages. A number of convenient rooms are offered in the monastery, many of which offer magnificent views of the largest mountain in the world, in the famous Buddhist Monastery at Tengboche. Janakpur( also referred to as Janakpurdham) is Mithila ‘s administrative and capital city, Nepal. The historical 500-year- old Janaki Temple is home to Indian Hindu pilgrims and international tourists. The Temple is a three- story building and 60 rooms, the massive marble structure of the 19th century is the largest temple in Nepal. Janakpur is also known for its more than 100 holy pools and ponds scattered around the quiet city. Lumbini is a Buddhist place of pilgrimage in Nepal’s Rupandehi district. It has a number of temples, including the Temple of Maya Devi and many others. There are also many monuments, monasteries and a museum, the Lumbini International Research Institute. There is also the Pushkarini or Holy Pond, where the mother of the Buddha took a ritual dip before he was born and where he had his first bath. Lumbini was declared a UNESCO World Heritage Site. Nice post. Love from Nepal.